Some i found reach few hundred thousand rpms while others range 30-60K. Whats the difference between electric ones and the ones that use a compressor? Get the Foredom machine. You will find so many other uses for it in your knife shop that you will wonder how you got along without one. Get the hand piece with the keyed chuck. Pass on the model with the collets. i read the info on their motors anyway, didn't understand much, so will check video library. The Dremel tools are a less expensive option.Some are Chinese made I beleive? Then there's the Chinese brand machines will last forever as long as you don't put a load on it. The Machine listed below on ebay will do all the wood, Bone etc carving and many other tasks.. Put this into the search box on Ebay. About $220.00 plus shipping. I've had mine for over 16 years and I replace the brushes about every 5 years and the flex shaft cable insides about the same. there are many tricks you can do with this machine for handle sculpting and carving.. LOW Maintenance costs. Simple to fix yourself. I have bin using the same Dremel tool for 15 or 20 years but i don't know if the newer ones are as good. Witch ever one you get you will wonder how you ever did with out it. Like Tim, I have owned my dremmel for many many years and never had a problem with it, but you probably want to listen to what Laurence has to say because he has been doing this longer than me. I have been using a Foredom flex shaft for the last 35 years. It is my "right hand" in jewelry work and I can see it will serve the same purpose in knife making. The amount of bits and accessories (would you believe a 1" x 10" belt sander and a 2" hand grinder?) Rock solid holding devices that work with the fkex shaft are available from GRS. The amount and type of "bits" is astronomical. Quick change hand-pieces allow for fast work. A spare shaft and a set of brushes make you good to go when you have problems at 12:00 at night. Foredom is not the only company that makes a good flex-shaft. Lucas industries (a dental tool mfg.) produces a very good, high quality unit., along with Pro-Craft and others. H/F also manufactures a flex-shaft. It's cheap. I have never used one, but I find most of their tools work...but are NOT for every day, high torque usage. Buy the extended warranty. For useful accessories, do a search for jewelry tools or flex-shaft accessories and check jewelry tool supplier's sites. Here's a trick for your flex-shaft. Got a very tight area that is hard to get to? Cut a tooth pick in half, chuck it up in your hand piece, put a little compound on it and go to town. I'm not fond of the foot pedal as it's hard to keep at a steady speed which seems to be what I need most of the time. Mine is circa. '70's A router speed control is hooked to my motor now instead of the pedal but it varies a lot in speed. also want to do carving and texturing on surfaces both soft (like handle materials) and hard like steel, titanium, etc. also i want to know the 'bits', i am guessing anything that is carbide, but what else? Attach the foot petal to the floor or I have a bigger piece of wooden board under mine. This will make keeping constant speed much easier. I don't care for the hand control models. using your foot means you can use both hands. I used Dremels for many years because that was all I could afford. They aren't made well any more and they keep changing how the accessories are attached, making older models obsolete. I also had to decide, air or electric, rotary or air chisel. For me, being a creature of habit, I stuck with electric and a rotary machine. I bought a Foredom Micro-Motor for $300 off e-bay. The motor is in the hand piece, so it's a little bit heavy, but if I can use it, anyone can. Now that I did, I realized that Dremels don't spin at a high enough rpm to have the control I have now, so my work has improved and it makes 1/2 the noise the Dremel did. Don't buy a Dremel. Foredom is a quality machine and you can't go wrong with one. Rotary tools are a little tricky, so give yourself time to learn to use it. Keep in mind that different tools/bits are rated for different speeds so even if you have a high speed machine, you can only run it at the speed rated for the tool you are using. 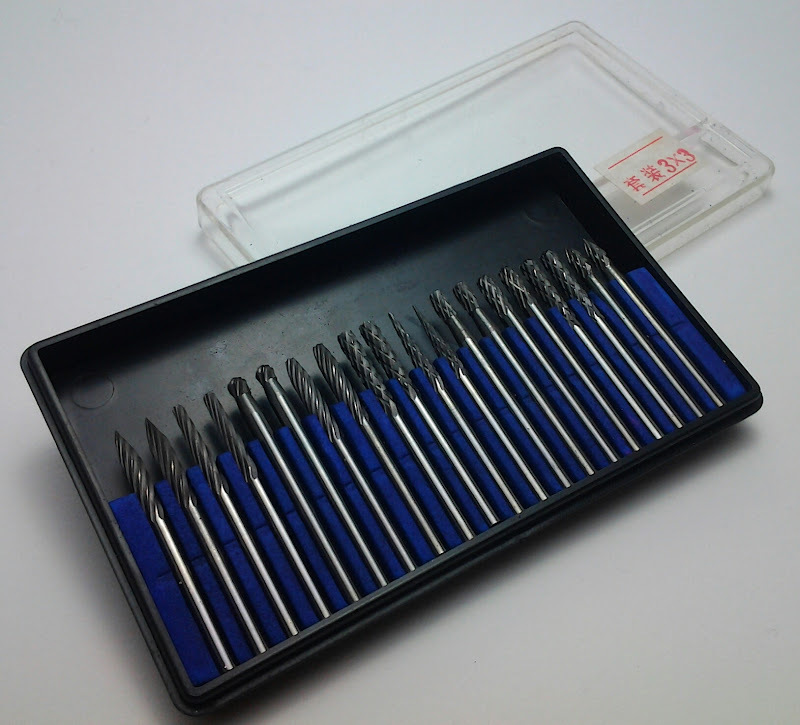 I use dental tools, end mills, Dremel bits and carbide tools. If you choose air, of course, you'll need an air-compressor and accessories and depending on where you use it, remember noise and size of the compressor. I believe air-tools have less moving parts, but require lubrication from time to time. i guess its electric rotary tool when i can afford it! If you really want to carve /engrave Hard Metal you really need high speeds like 300,000 rpms . Trouble is a good hi-speed handpiece will cost you from $300 to 400 dollars US. It's a dental handpiece and used in dental labs. Powercrafter I believe is a little cheaper, but not real quality. If you can save up for one you'll not be sorry. I've only been using one for 25 years. thanks a lot Wolfe, any specific makes? Thanks. Shoku, Ney and a few others. If you are ready to jump I'll give you some info for a used or rebuilt unit. thanks Wolfe, depends mainly now on price, you can pm it and see from there. now what to test with those, what to test with those?! And a 40,000rpm electric cheap chinese micro motor. High speed pneumatic is handy sometimes, but very often I find the micro motor is just as good... more torque even though it's got less speed. You're usually stuck with 1/16. I got a battery powered one too recently which has collets so I can use 1/8th, 1/16th and 3/32, pretty cool. Always been interested in flex shafts but never got to try one, I'm sure they're better than my dremel.